A person whose vision is worse than 20/200 with glasses or contact lenses is considered legally blind. A person with 20/20 vision is considered to have perfect vision. The first number in the fraction refers to how many feet a person stands away from the examination chart, while the second number refers to the distance from which a person with normal vision could read the same line of type. 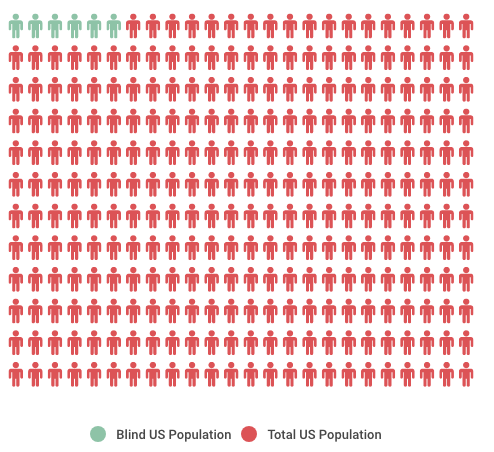 The 2014 American Community Survey says that 6.9 million non-institutionalized individuals suffered from a visual disability. According to the 2014 American Community Survey, 665,200 students reported a visual disability. There are myriad things that can cause blindness. Glaucoma is the second-leading cause of blindness, behind injuries to the eye itself. Diabetic complications and macular degeneration can also cause visual impairments, thought diabetic complications usually only happen after a long period of time and macular degeneration usually only happens to people over 60. Infantile glaucoma, retinal dystrophies and congenital cataracts can cause vision problems in infants and children. However, the issue with diagnosing vision problems early in a child’s life is that a vision test is not performed at birth unless a parent has a heredity vision problem, in which case a doctor would know to screen the child, or a visual impairment is visible in the infant. Because visually impaired children cannot express themselves in a way a parent can understand, they often go undiagnosed for long periods of time. However, the window for many potential vision-saving surgeries is within the first six months of a child’s life. In addition to the complications of vision impairments, about 70 percent of visually impaired children have additional disabilities. This further delays treating whatever is causing the eye problems. However, this can cause developmental delays. A normally developing child sits up without assistance at 6 months old. However, much of this initial development comes from seeing things around them and imitating them. A visually impaired infant can’t do that — especially if they aren’t being assisted properly.